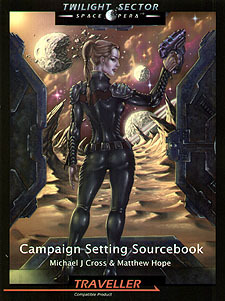 The Twilight Sector Campaign Setting Sourcebook reveals the Orion Frontier, the ragged edge of explored space, and the mutants that dwell within. Inside you can find everything needed to explore the vast reaches of war-torn human space and the dark recesses that lie beyond. Unravel the mysteries of the Terra/Sol planetary system and carve a name for your self among the stars. Requires the use of the Traveller Main Rulebook.